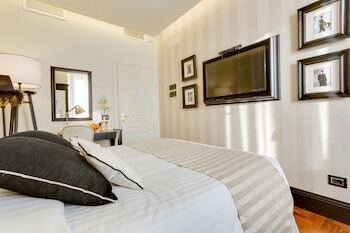 With a stay at Bellezza al Colosseo in Rome (Celio), you'll be minutes from Arch of Constantine and Colosseum. This bed & breakfast is within close proximity of Porta Portese and Arch of Titus. Make yourself at home in one of the 4 air-conditioned rooms featuring minibars and flat-screen televisions. Complimentary wireless Internet access keeps you connected, and digital programming is available for your entertainment. Conveniences include laptop-compatible safes and desks, and housekeeping is provided daily. Grab a bite to eat at one of the bed & breakfast's 10 restaurants and 10 coffee shops/cafÃ©s, or stay in and take advantage of room service (during limited hours). Featured amenities include dry cleaning/laundry services, luggage storage, and a library. A shuttle from the airport to the hotel is provided for a surcharge (available 24 hours), and self parking (subject to charges) is available onsite.